[unpad.ac.id, 11/5/2018] Unpad Business Incubation Center (Oorange) held an “Innovation Expo 2018” event at the Unpad Training Center’s yard, Ir. H. Djuanda Street No. 4, Bandung, Sunday (4/11) until Tuesday (6/11). 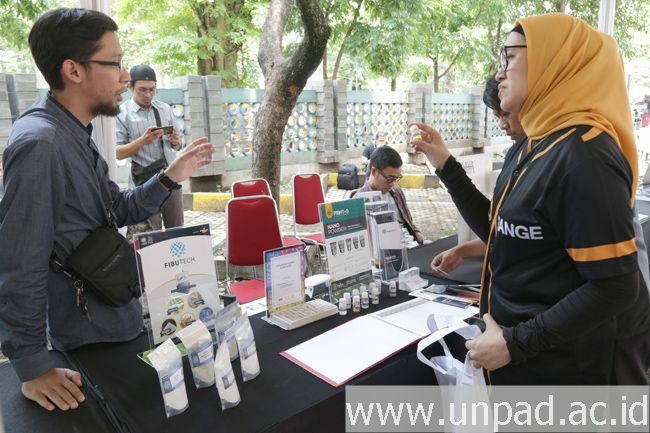 Director of Unpad Oorange Diana Sari, M.Mgt., PhD, explained, this activity was an event to showcase a variety of superior products from the inventors and partners of Oorange Unpad’s business partners to the general public. “(In addition), this exhibition itself aims to introduce the Science and Technology Zone and Unpad Business Incubator Center (Oorange) to the public,” Diana said when met on the sidelines of the activity on Monday (5/11). A total of 12 Oorange incubation entrepreneurs and 30 Oorange business partners joined this exhibition. In addition to introducing products from research and entrepreneurship, this activity also sought to build synergies between inventors and business partners. This synergy is expected to increase Unpad’s strength in supporting achievement as an entrepreneurial university. Furthermore Diana said, the “Innovation Expo” was also filled with a number of activities, including a talk show related to the management of the start-up business, sharing sessions with a number of well-known business people, meetings with investors and venture capitals and a number of entertainment. By being held in an open space, it is expected to facilitate public access to the exhibition. “In essence, we want to introduce to the public that we have downstream research products. Of course there are certain treatments from the research before entering incubation,” Diana said. The business incubation process in Oorange itself includes pre-incubation, selection, incubation, and postcubation. In the incubation process, business people are given various types of financial management training, digital marketing, and sustainable business management. It also provides a mentoring room for business people. Unpad Oorange also facilitates financing for business actors. At present, said Diana, it provides a number of funding from Unpad, the Ministry of Research, Technology and Higher Education, to Oorange partners.